Are you as fascinated by snow globes as we are? We still remember shaking the globe and watching the snow drift down on the scene within. 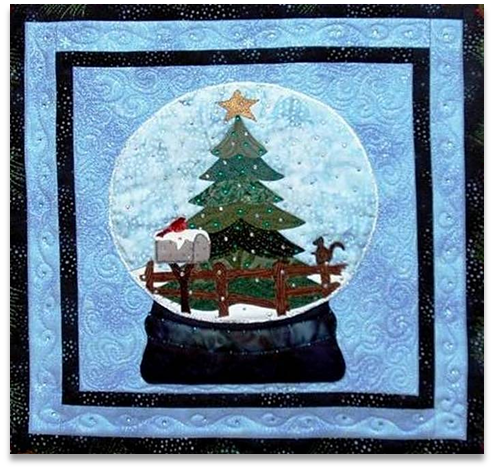 Deb Madir has captured the magic of the season in a delightful series of Snow Globe Quilts. She says: "When starting a new design project, I try to envision something that's different; has not been seen over and over. 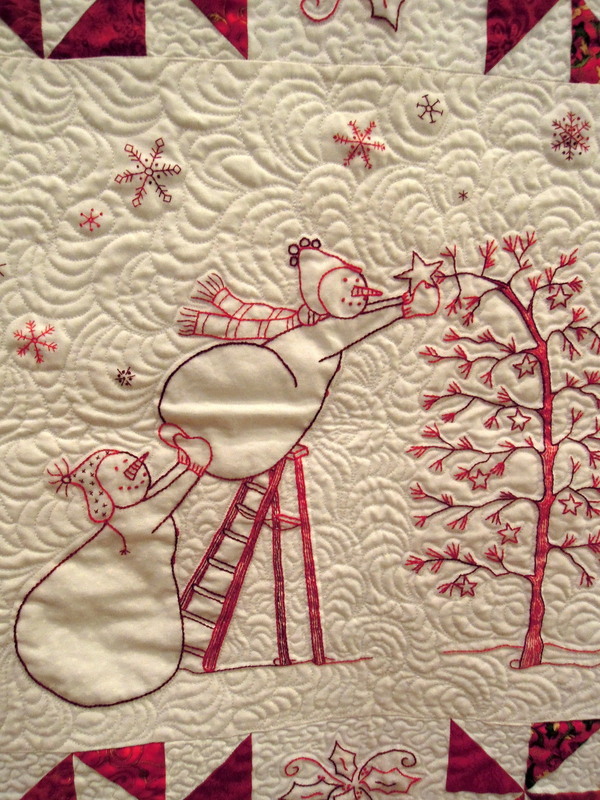 I try for fresh, fun or whimsical; but most of all, a quilt I would enjoy having hang around my home!" 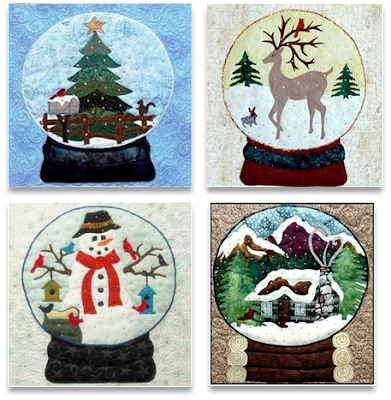 Here are four different Snow Globe designs by Deb Madir. In the montage above we're showing just the globes so that you can see the detail; each finished quilt, which ranges from 18" to 21" square, has a unique border that complements the scene. The finished quilts and more details can be seen at the following links. Let it Snow depicts a sparkling winter wonderland; Best Friends Forever showcases an elegant reindeer; Winter Layover features a snowman and winter visitors; and Snowed In depicts a cozy log cabin. We love the wintry scene in "Let it Snow", shown below. Here is a perfect winter scene with evergreen tree, a wooden fence, mailbox with bird and a little squirrel. The snow globe is decorated with Swarovski crystals, adding a sparkle that is perfect for the holidays. "Let it Snow" finishes at 18" square (see the finished quilt here). We love to see a brilliant red cardinal in the middle of winter! 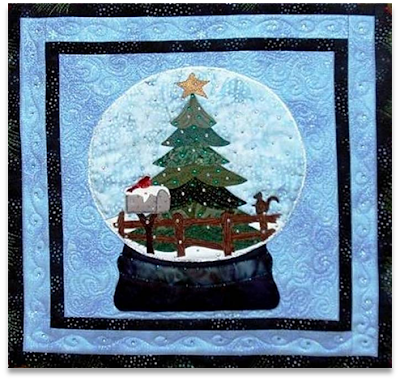 "Northwoods Duet" is Deb Madir's latest design and the fifth in the popular Snow Globe series. Deb has created a lifelike red cardinal and yellow oriole, perched among the evergreen branches and embellished with thread painting and Swarovski crystals. The red border features a series of flying geese to complement the scene. Image credits: Images are shown with the generous permission of Deb Madir. 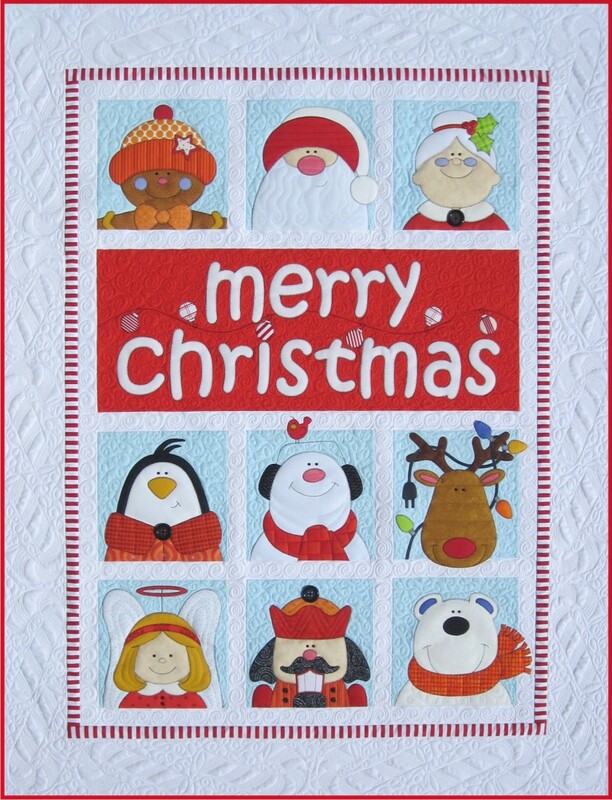 Her pattern range includes many more holiday quilts including Holiday Sparkler, Snowman Sparkler and Poinsettia de Noel. When we think of Christmas time we think of the Nutcracker Ballet. Nutcrackers come in such fun shapes and sizes that many people collect them. If your house does not have room for collections, how about a nutcracker quilt ? Here is a delightful pattern by Amy Bradley. You can see Amy Bradley's distinctive and fun style in these cute characters. There are three different nutcracker blocks that repeat in each row for nine blocks altogether, and each one is slightly different. We've admired the blocks made by Karen Snyder of Anna Lena Land (you may know her as the designer of fabrics, especially 1930's reproductions, for Timeless Treasures). 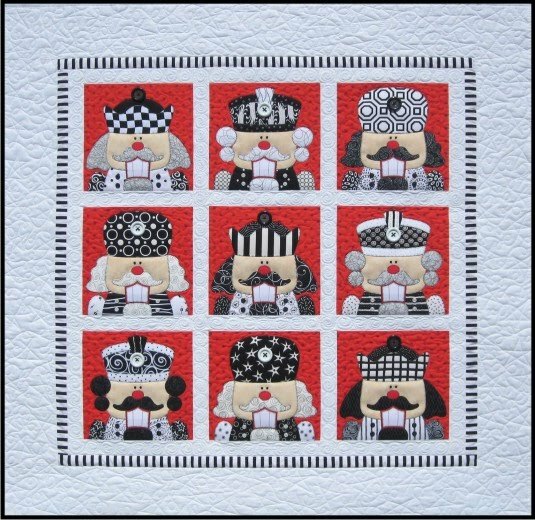 Karen chose some wonderful black-and-white fabrics for her nutcrackers; she even fussy-cut some of the pieces as shown below. 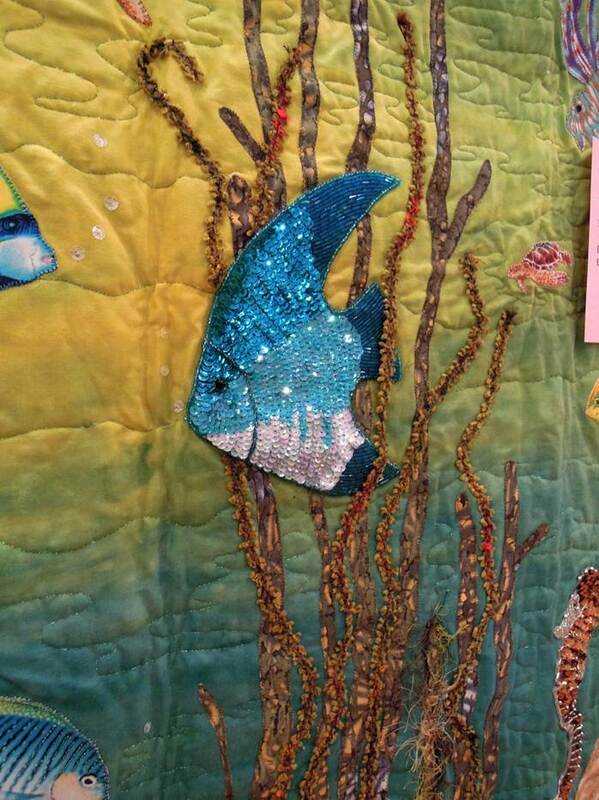 In this photo you can see that Karen Snyder hand stitched, with a blanket stitch, around each of the applique pieces. The nutcracker's mouth is also stitched with embroidery thread, and buttons are used for the nutcrackers' eyes and the top of his hat. We also love the starry red fabric which Karen used for the background. 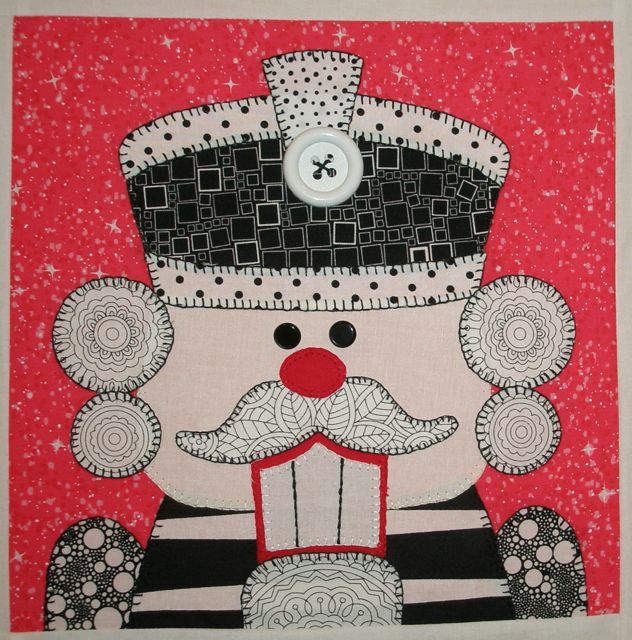 The nutcracker is just one of nine different figures in Amy Bradley's Merry Christmas Quilt pattern, shown below. This quilt has every figure we associate with the season! Here you can see an adorable gingerbread man, Santa and Mrs. Claus, a penguin, snowman, reindeer, angel, nutcracker and polar bear. The pattern has instructions to make the Nutcracker and Penguin versions - each of which is 48 1/2" square - and a felt pillow. You can even choose between "merry christmas" or "happy holidays" for your greeting. 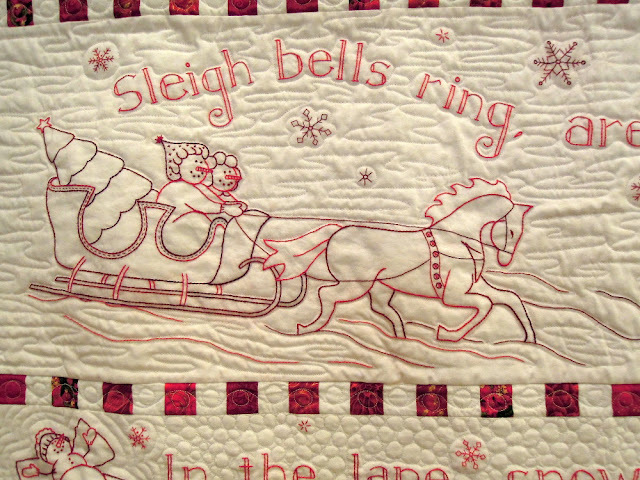 'Tis the season to share a few more of our favorite Christmas quilts. This year we're focusing on figures of the season, including nutcrackers, gingerbread men and snowmen. 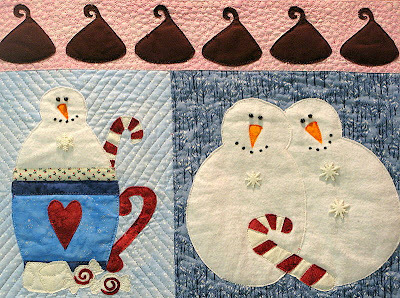 When we came across "Snowman Soup" at MooseStash Quilting, we couldn't resist! 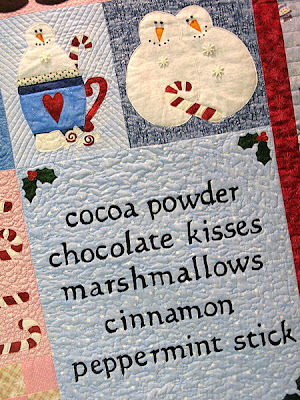 As the description says: Chase away the cold this winter with a steamy, hot cup of cocoa while you snuggle for warmth under this fun little quilt. 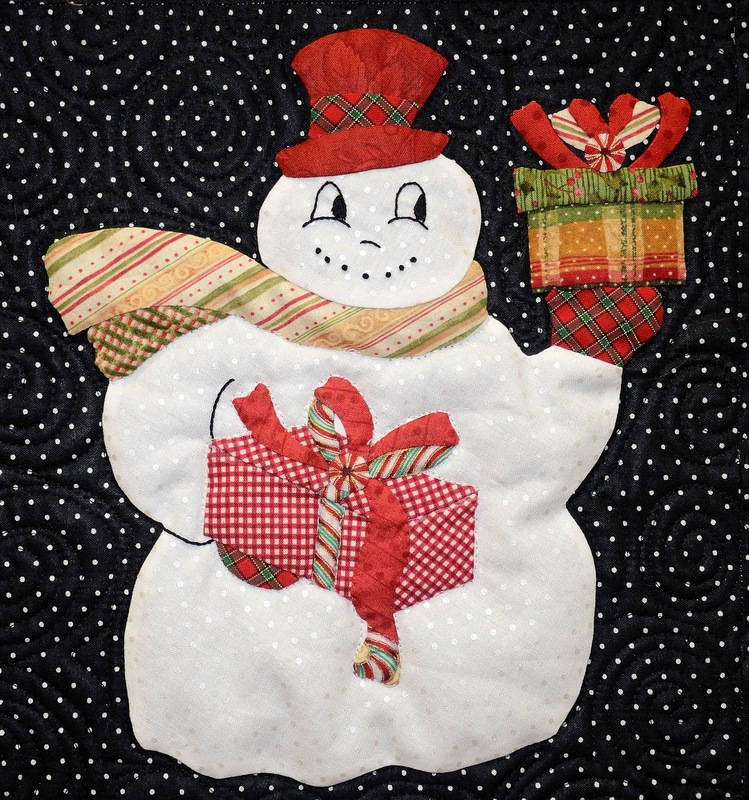 "Snowman Soup" is Joan's entry in the Fall 2012 Blogger's Quilt Festival in the Favorite Applique Quilt category. She says: "I fell in love with this pattern when it was released at Angie's Bits and Pieces. Hot Cocoa and cinnamon sticks... yummmy!" We love the refreshing pink, blue, red and white color scheme. The ingredients in "Snowman Soup" are shown in the text block shown below. Any chocolate lover would fall for this recipe! Here are a few of the silly snowmen, below, with their beaded eyes and snowflake buttons. A row of chocolate kisses marches across the top of these blocks. The blocks are created with fusible applique, which is Joan's favorite method; Joan did the quilting on a domestic machine. Joan, who blogs at MooseStash Quilting, has been sewing for almost 50 years. 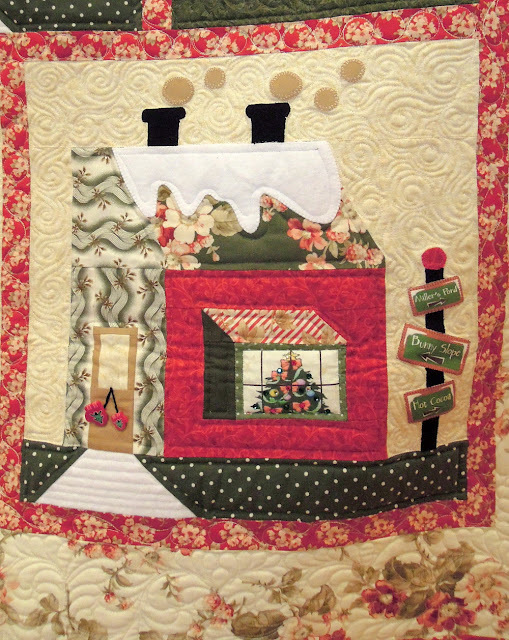 After a 14 year career as a professional crafter, she was introduced to quilting and has been hooked ever since. The name, "MooseStash", came from Joan's love of Alaska and its wildlife, combined with her piles of stash. She says: "By creating new projects, and using up my mounds of stash, I hope to inspire others to do the same." You can see many more of Joan's wonderful quilts at calicojoan's photostream at Flickr. Angie Padilla's international business, Angie's Quilt Pattern Shop, is based in Quito, Ecuador. Angie's highly original designs are rich in colorful applique work. 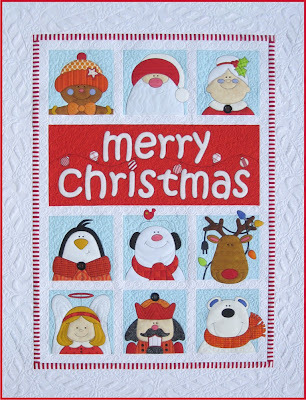 We previously featured Angie's fabulous Christmas Dove, Snowflake Delight and Matryoshka quilts. 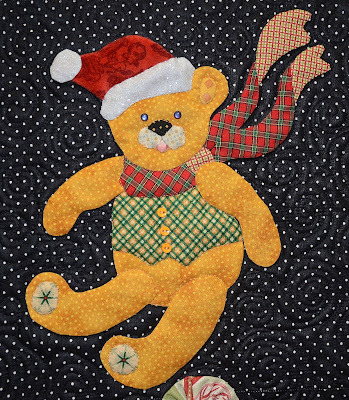 Image credits: Images are shown with the generous permission of MooseStash Quilting and Angie Padilla. 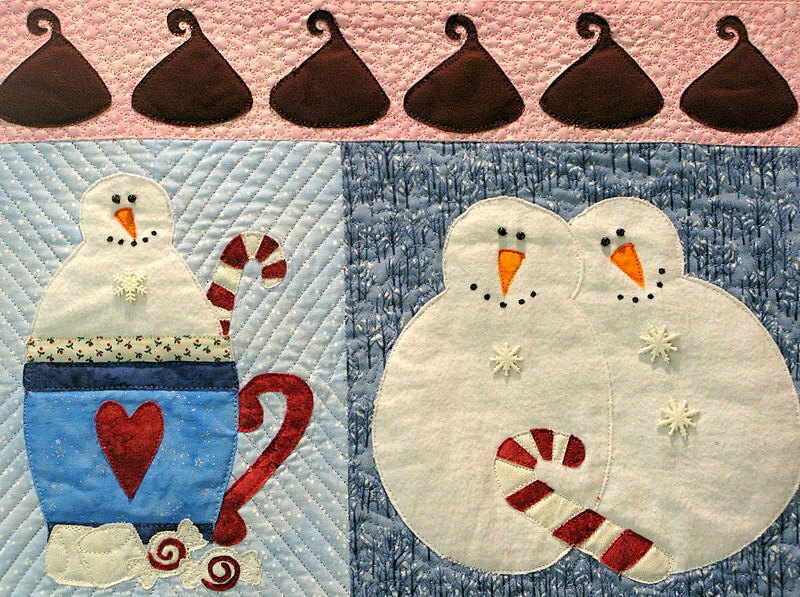 For more close-up photos of Snowman Soup, see this post at MooseStash Quilting. 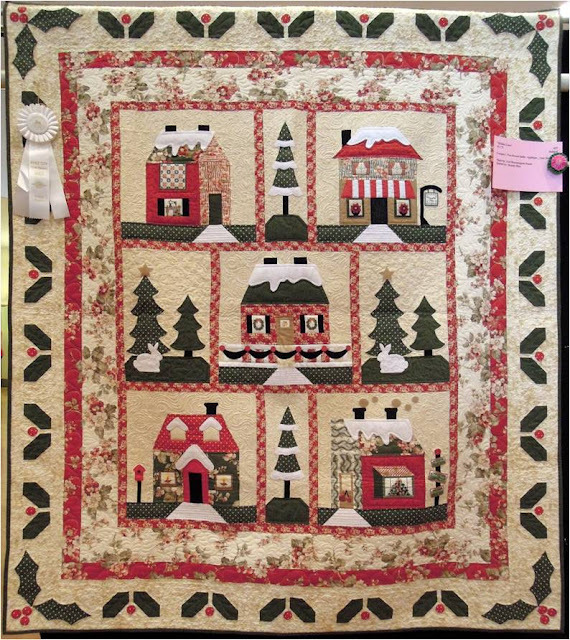 We recently visited the River City Quilters Guild quilt show in Sacramento, California, where we saw some lovely quilts with a Christmas theme. This cheerful quilt with its cozy houses and decorative holly leaf border won a third place ribbon in its category. 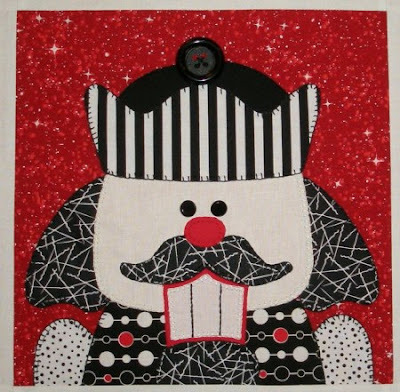 We recognize this as a design by Arlene Stamper and Melissa Harris at The Quilt Company. This is the Holiday Inn block: The Holiday Inn is decorated for the holidays with a Christmas Tree in the Window. The three signs out front give directions to where the fun is at! There's "Miller's Pond" for ice skating, and skiing at the "Bunny Slope" with "Hot Cocoa" to warm you up afterward. Phyllis says: "Made for my son and daughter-in-law. First time to do redwork." 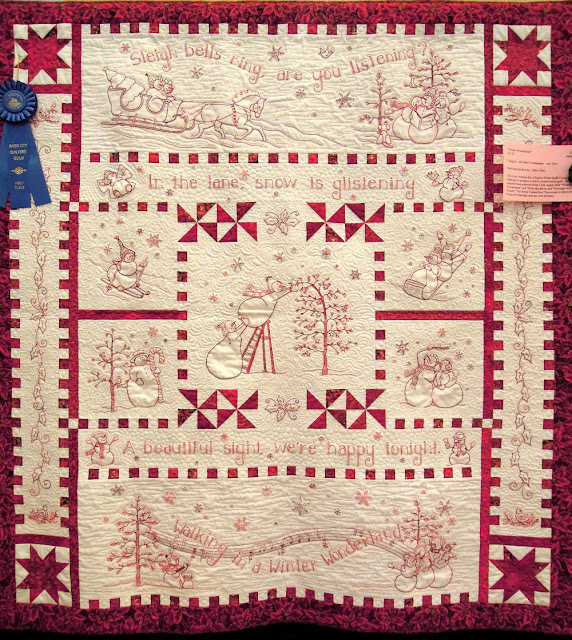 The "Over the Hill and Through the Woods" pattern is by Meg Hawkey at Crabapple Hill Studio. Meg says: "The little family travels in a horse drawn sleigh through the snowy woods & across the river to Grandmother's warm & welcoming farmhouse. You can practically smell the turkey roasting!" 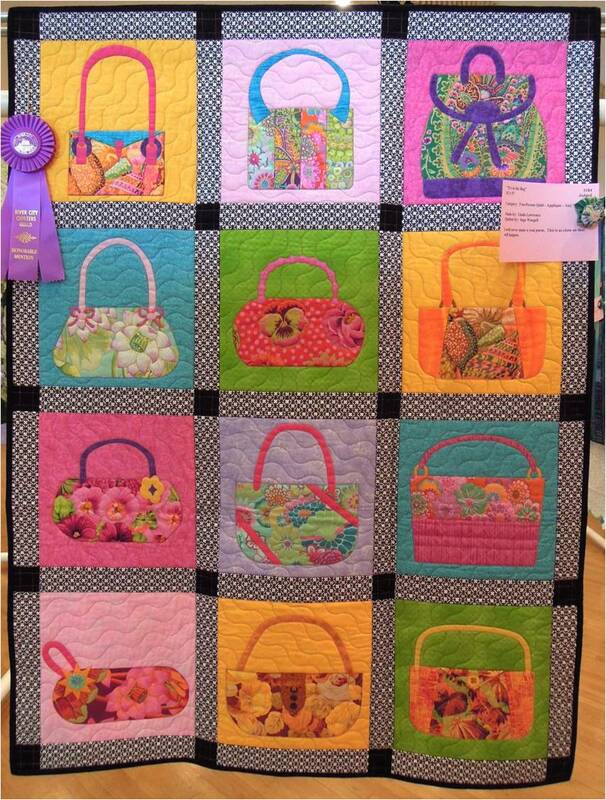 First place winner for "Best Group Quilt", this is the RCQG’s Opportunity Quilt for next year's 2013 show. It is adapted from Jennifer Chiaverini’s Caroline’s Wedding Quilt from her book Traditions from Elm Creek Quilts (A Double Wedding Ring embellished with floral appliqués, a cherished gift for a very special bride). 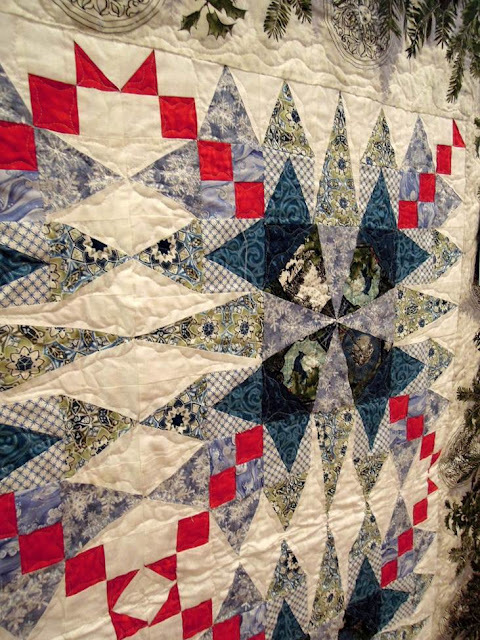 The quilt was made by 25 applique artists and 4 piecers. This truly lovely quilt has subtle color gradations, which gives it an elegant luminous quality. In this close-up, you can see the intriguing center floral applique motif. Teri notes, "I saw this block in a magazine. It is a wonderful block for the beautiful Christmas fabrics. I’ve had fun making many table runners and 3 quilts." Blue ribbon winner for best quilt utilizing all other techniques, Mary notes, " This is my creation for a Zephyr Point Quilt Camp challenge to produce a winter wonderland quilt. 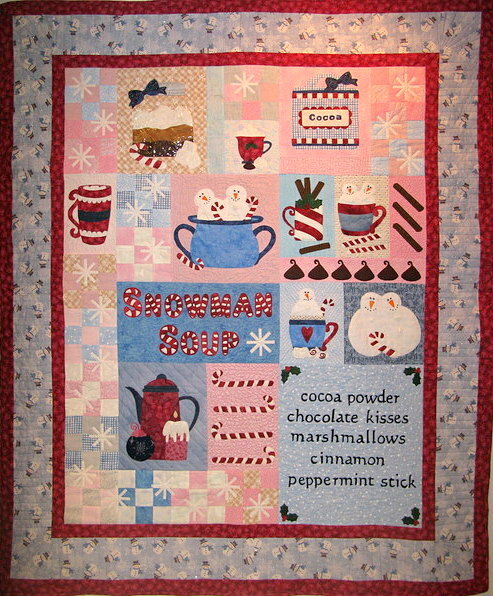 It is adapted from patterns from Crabapple Hill’s "Winter Wonderland" and "Over the River and Through the Woods"; The Stitch Connection's "Snowman Collector"; Winter Twitterings [by Pearl Louise Krush] and my own designs." Phyllis Day writes, "I decided it would be nice to have a Christmas quilt for every bed in our home. This is a start." Thursday, November 22, is Thanksgiving Day in the United States. On this traditional day for expressing gratitude, we'd like to say how much we appreciate all our readers, your kind comments, and your loyalty. Happy Thanksgiving to all of you and your families ! Please stay tuned for photos of lovely Christmas quilts as we resume our coverage on Friday, Nov. 23, of the River City Quilters' Guild show from California. We're in the middle of displaying some gorgeous quilts from the 2012 River City Quilters' Guild show in Sacramento, California. Please join us for Day 3 ! 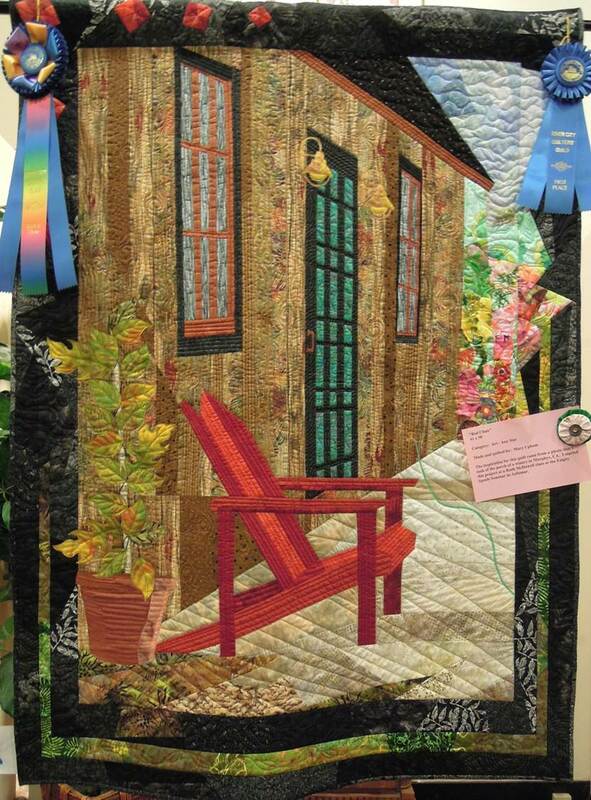 Artist Sally Willey writes about this Judge's Choice winner and First Place winner for best hand quilting, "I love blue birds and have two blue bird houses on our property. A fun quilt to make and it always makes me smile. Hand quilted by my sister Chloe Bradshaw." We recognize the design as My Whimsical Quilt Garden by Piece o’ Cake Designs. 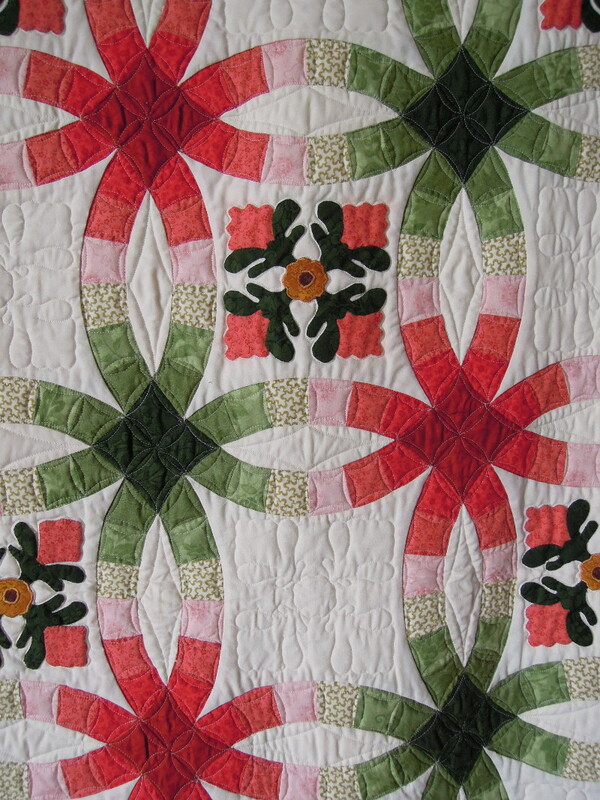 Sally's quilt has a wonderful border, which echoes the flowers, leaves and stems of the blocks. 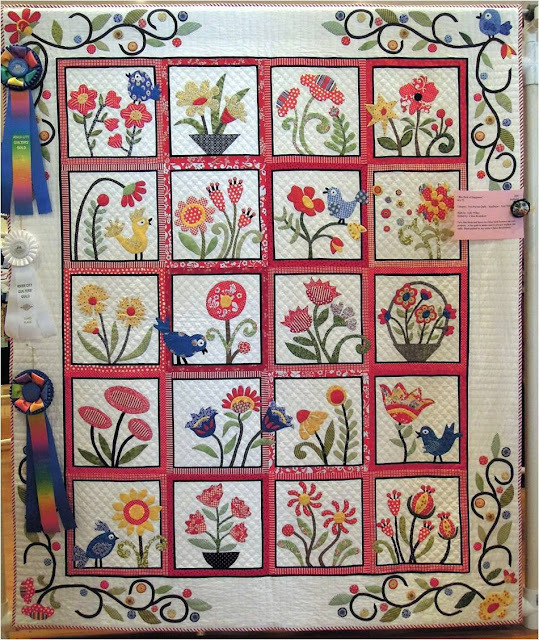 Here's a quilt which fits perfectly with the theme of this year's show: "Rhapsody in Bloom." Chloe Bradshaw's immaculate and precise hand quilting really shows up well here. Notice how the lively flowers and bluebird extend themselves into the cheerful red and white sashing to provide a charming, informal effect. These little bluebirds seem to be full of personality; you can almost hear them singing their hearts out. We love this applique technique, which turned out extremely well. 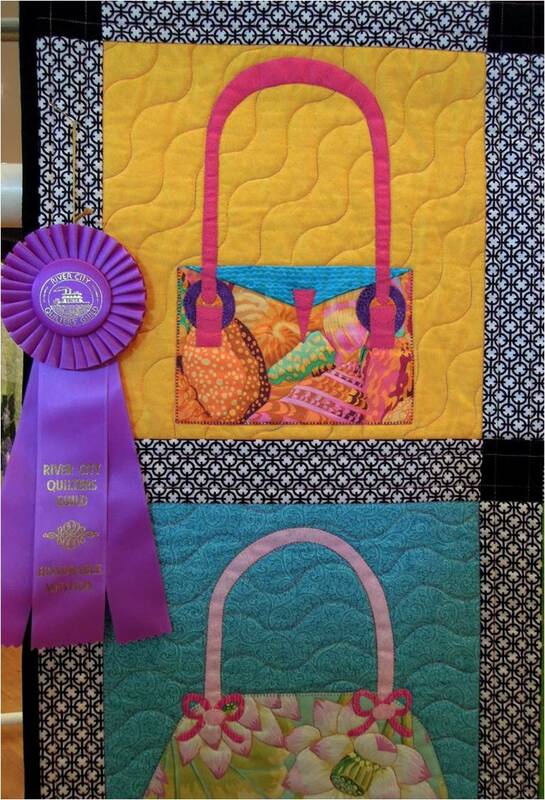 Honorable Mention winner for Two Person Applique Quilt, Linda Lawrence writes, "I will never make a real purse. This is as close as that will happen." Note: we recognize some Kaffe Fassett fabrics in the purses. This cute, colorful pattern really brought a smile to our faces. A girl can never have too many handbags, especially when they're as eye-catching as these pretty ones! Are you ready to go shopping? Second place winner for Large Pieced Quilts, Kathy says, " I watched the Red and White Quilt Show held in New York City in March 2011 on YouTube. It was amazing; but this one quilt caught my eye and I was inspired to make it. I’m sure it’s the only two-color quilt I will ever make, but I was happy with the result." 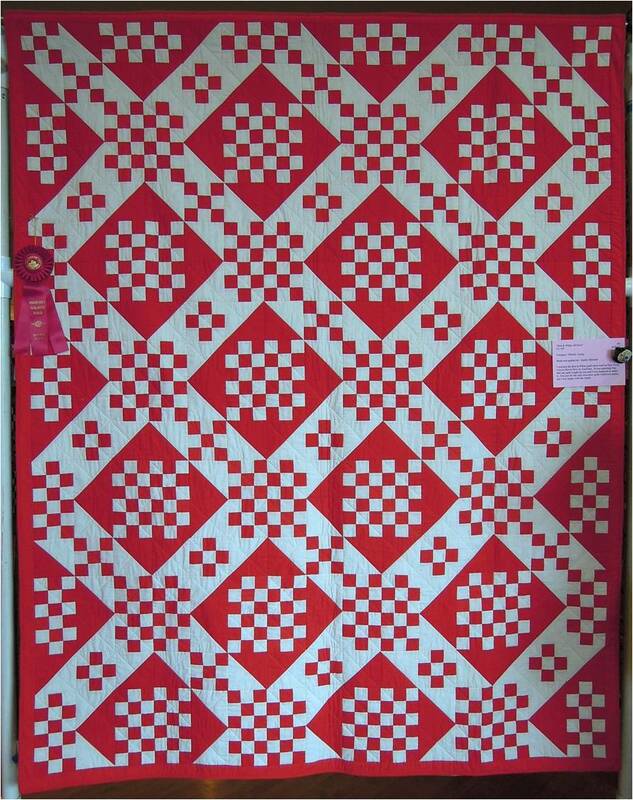 Pure red and white is a dynamic combination, and Kathy's excellent pattern selection really shows off these two colors to their best advantage. 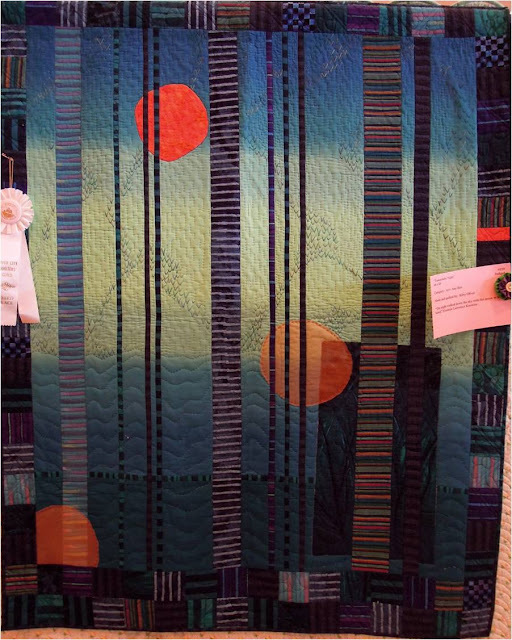 Third place winner in the Art Quilts category, Kitty Oliver describes her quilt by writing, " ‘The night walked down the sky with the moon in her hand’. Frederic Lawrence Knowles." The background ombre fabric seems to be hand-dyed, creating a luminous evening sky. The pumpkin orange moon provides an excellent warm complementary color to the indigo, periwinkle, and tinted aqua tones of the background. These interesting large embroidery stitches in the background provide interesting detail and depth to this work. Note the moon done in mesh fabric here, almost as if we are looking at the reflection of the moon on the ocean. Mary writes, "This is my version of the cover quilt on the Gai Perry 24 Quilted Gems book. Gai got me started but it hung on my design wall for many years waiting for a border. I am happy that it is finally finished." Mary has chosen lovely jewel-tone batiks in cool hues to show off the contemporary trapezoid-shaped pieces of this very interesting pattern. 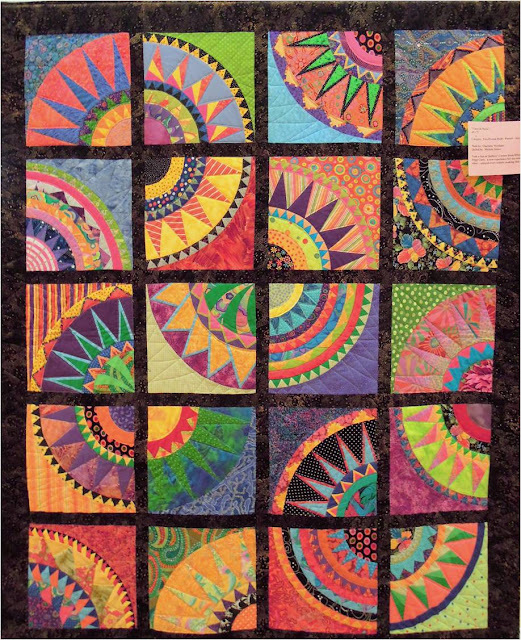 Images: All photos are by Quilt Inspiration. 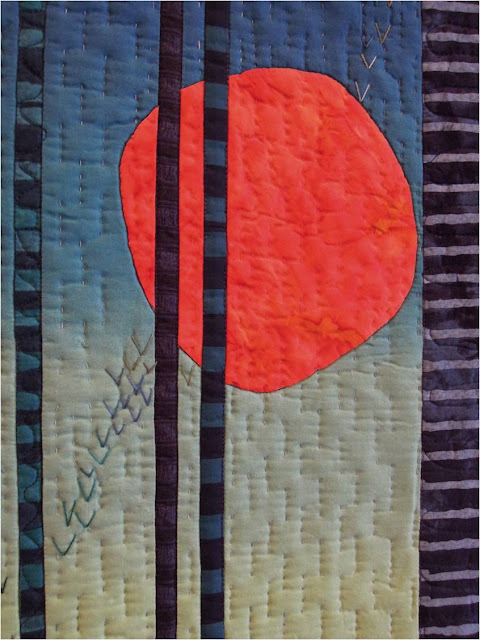 Welcome to Day 2 of the River City Quilters Guild show in Sacramento, California. 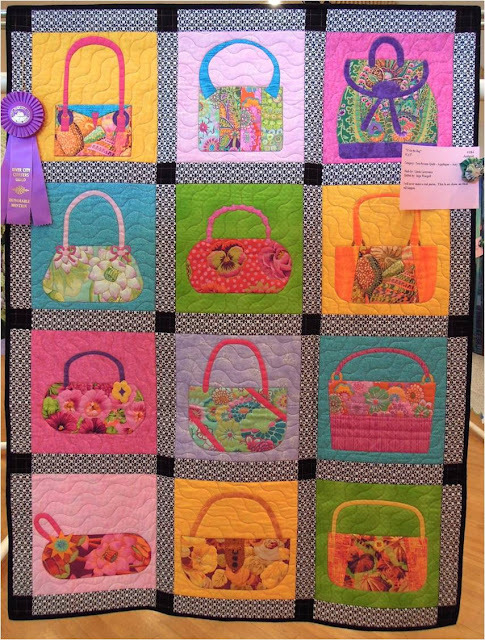 This guild has many talented quilters, as you'll see below ! 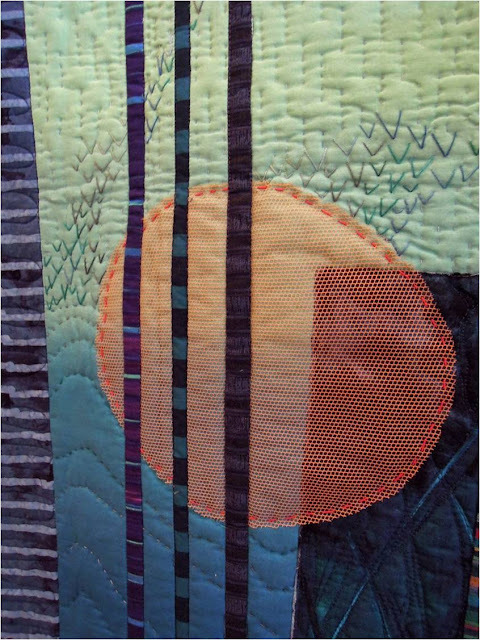 Charlotte tells us, " [I ] took a class at Quilters’ Corner from Ellen Garner and Peggy Clark. A new experience for me using brilliant colors – enjoyed every minute making this quilt." This New York Beauty pattern with its exuberant swirls of warm and cool hues does indeed remind us of a giant, very fun fiesta. We recognize "Cinco de Mayo" as the pattern on the cover of the book by Karen K. Stone; Charlotte's version has sashing between the blocks. Some of these blocks have over 100 pieces. First Place award winner for an Appliqued Miniature Quilt, Mary writes, "I designed this quilt as part of a “Whisper Challenge” for the Studio Art Quilts Association. My inspiration came from a photograph, and the quilt is an original of my own design" Using a variety of different patterns and shapes for the red blossom gives it an exotic, tropical look, which helps to create a dazzling focal point against the green and taupe foliage. Debra notes, "Creativity untamed [means] the limited use of rulers and cutter. 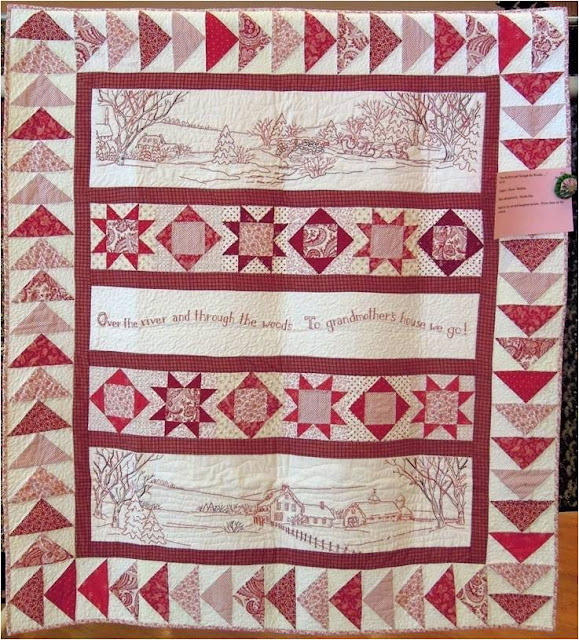 [This pattern is] a Split Log Cabin – Gees Bend design, taught by Stacey Sharman at New Pieces Quilt Store in Berkeley, California." 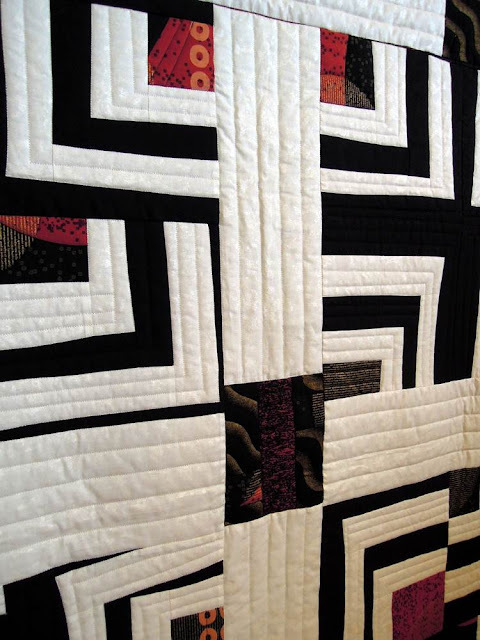 Notice how the large, bold, eye-catching geometric patterns are enhanced by the vertical parallel quilting lines for the larger blocks. This sophisticated, balanced design creates a very striking contemporary effect. Marcia writes, "I took a class with Marjan Kluepful using her hand-dyed fabrics. This was a lot of fun to make." 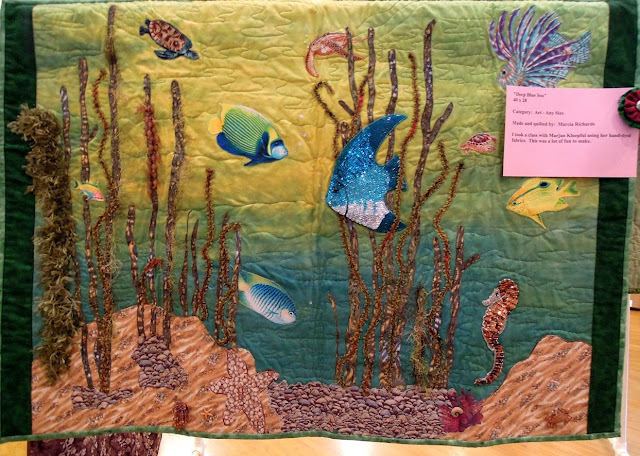 The hand-dyed fabric in the background appears to us as sunlight streaming into a captivating world of life beneath the ocean. These sequined and beaded sea creatures, including the large blue fish and the little sea horse on the right, really provide a glittering effect to this fascinating underwater scene. Notice how Marcia has used coarse textile threads and fibers for the waving seaweed in order to create an interesting three-dimensional effect. Shirley notes, " [This quilt project was] a challenge for a quilt retreat at Zephyr Point, Nevada." Shirley has done a great job in creating a work that depicts a restful, snowy day in deep winter, amidst the pine branch motif of the inner border. We recognize this as the "Ice Dreams" pattern from the book, Quilts of the Winter Solstice, by Jason Yenter at In The Beginning Fabrics. Here's a close-up of these pretty snowflake blocks, with their points gently reaching towards each other. 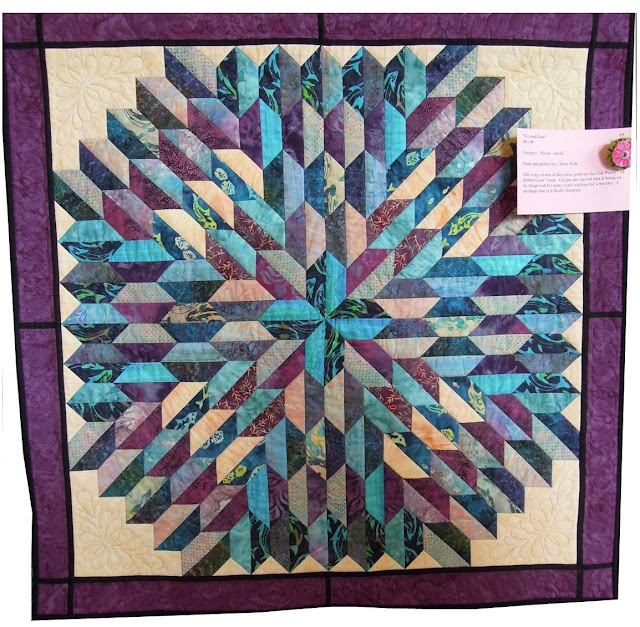 If you're inspired to make this quilt yourself after seeing Shirley's fine work, then you'll find the "Ice Dreams" fabrics designed by Jason Yenter, as well as an entire quilt kit online at Quilting by the Yard. "Rhapsody in Bloom" was the theme of the River City Quilters' Guild 2012 Quilt Show, which took place from Nov. 14-16, 2012 in Sacramento, California. 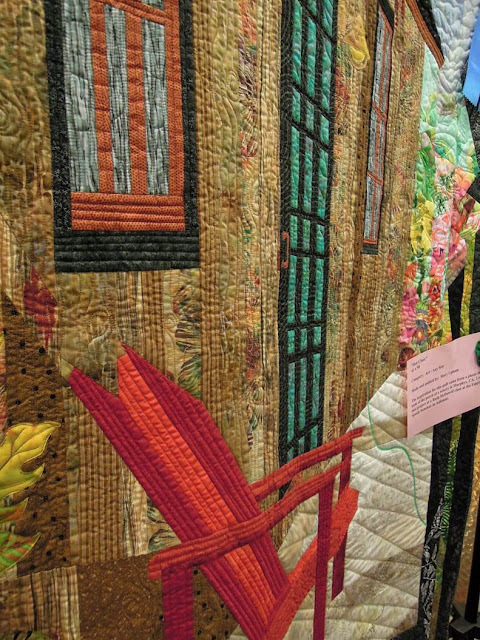 We really enjoyed the exhibits put on by this local guild, and we have many fantastic quilts to show you ! This year's Opportunity Quilt was adapted from a pattern by Crabapple Hill Designs. 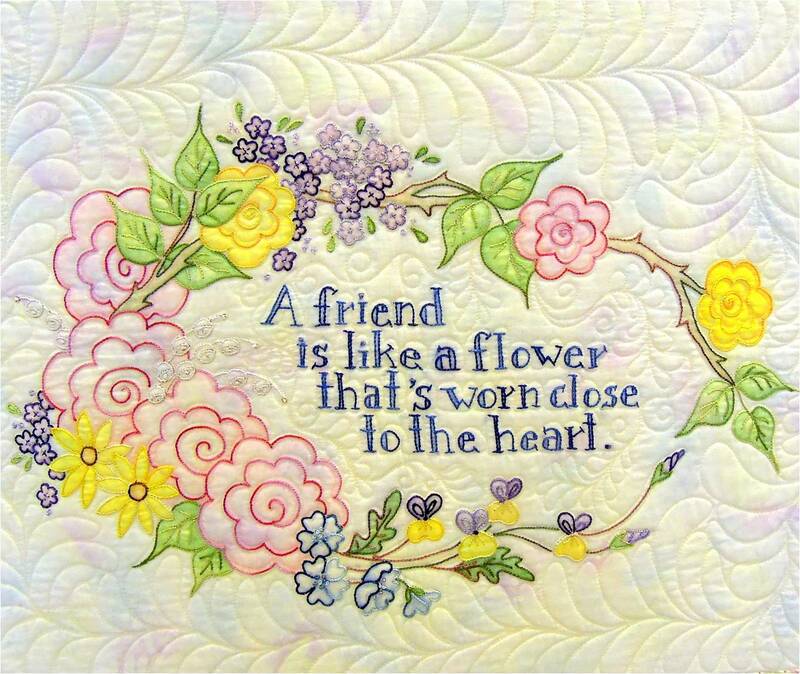 The blocks of delicate floral motifs, and blossoms in soft pastels remind us that cultivating good friendships is like tending to a cherished year-round garden. Winner of the "Best in Show" award and First Place winner in the Art Quilts category, Mary writes, "The inspiration for this quilt came from a photo that I took of the porch of a winery in Murphys, CA. I started this project at a Ruth McDowell class at the Empty Spools Seminar in Asilomar, California." Mary's perfect piecing work has resulted in a life-like depiction of an inviting, homey porch on a sunny afternoon, with one's favorite chair waiting to be occupied. The strong vertical lines of the house are mirrored in the vertical lines of the chair's colors and quilting pattern.The house, chair, and the garden have a very comfortable rustic look to to them, as a place to relax and daydream. 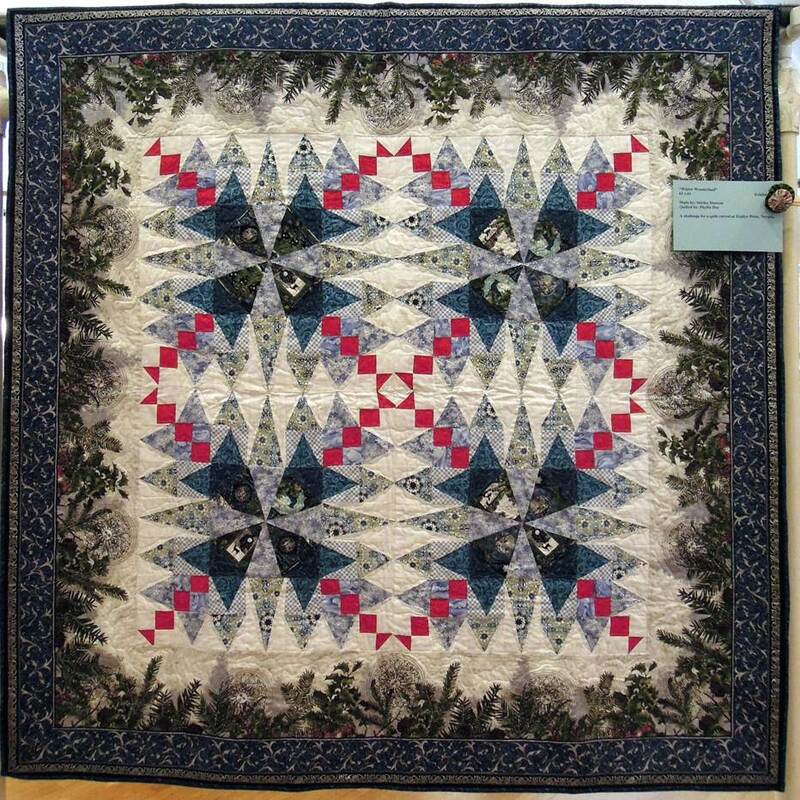 Blue ribbon winner in the Scrap Quilts category, Linda says "This star is a variation of the Star of Bethlehem; all paper pieced with Civil War fabrics." 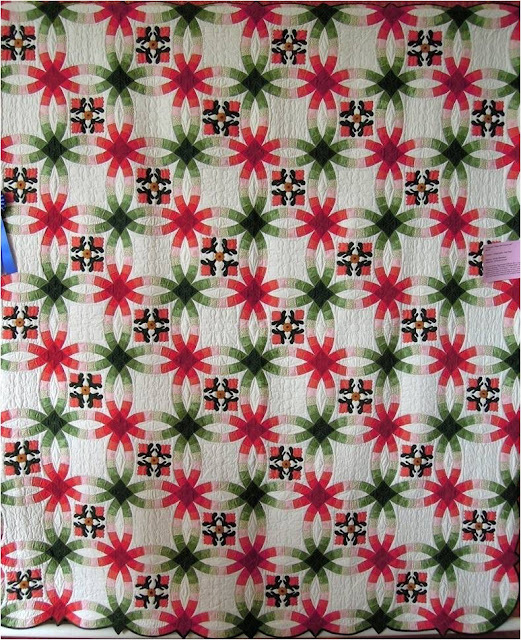 We recognize this design as the "Unusual Lone Star" pattern in the book, 'Quilts by Karen K. Stone'. Linda has done a wonderful job with a fabric selection of mostly browns, reds, and oranges, which contrast nicely with the taupes and ecru shades of the background fabrics. Here's a close-up of how this graceful contemporary star is constructed. 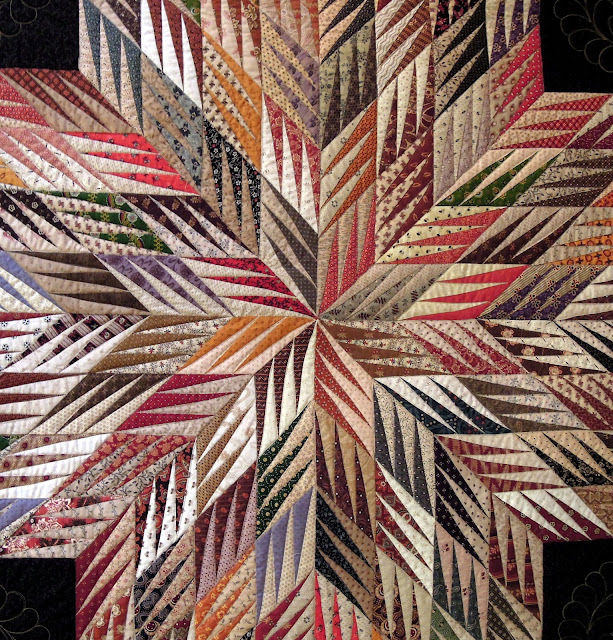 The triangles are paper-pieced into smaller diamond blocks, then the blocks are sewn together to make larger diamond components of the eight-pointed star. Winner of a Judges' Choice award, Linda writes, "This portrait was made in a Ruth McDowell class-from a picture of Bridget; pattern was made in class, and this is a form of paper piecing." 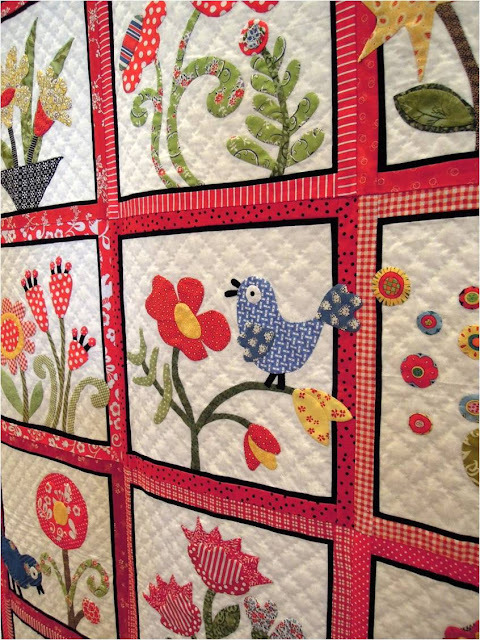 Complementing the darling polka dot sashing is the ladybug in the center of each quilt block. Can you spot the cute quilting patterns of the bugs which are stitched into this block? ( Hint : One bug's head is in the blue background, on the right hand side of the block). 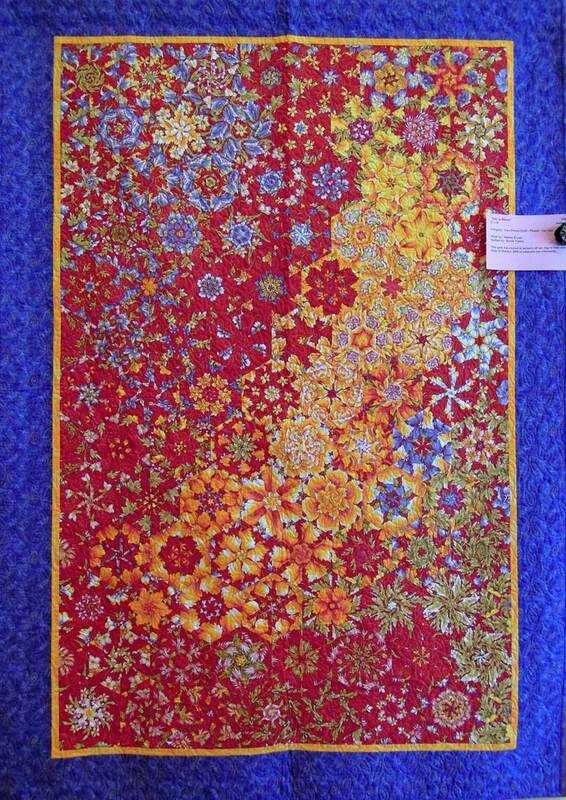 Malene tells us, "This [one-block wonder] quilt was created in memory of our trip to Italy and Sicily in October 2009 to celebrate our retirement." These lovely primary colors and the cheerful round symmetrical patterns remind us of the beautiful hand-painted folk art plates that travelers find throughout sunny Italy. Lynn Wilder has been quilting seriously for the last 15 years and teaching quilting classes for the last five years at In Between Stitches in Livermore, California. 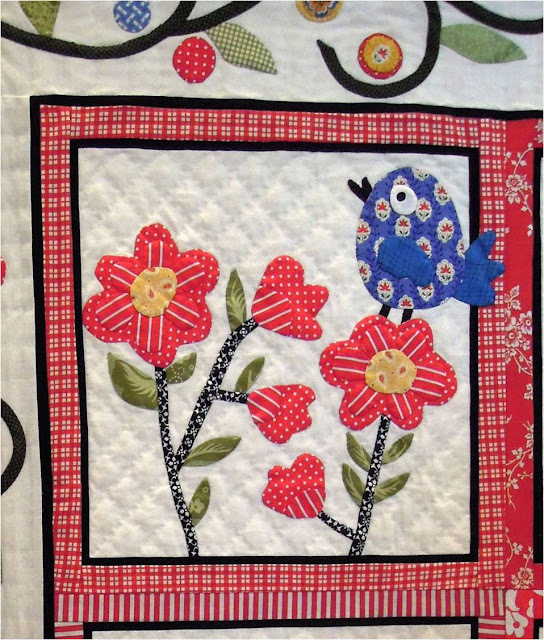 She enjoys designing and making traditional quilts, combining her love of appliqué with pieced blocks. 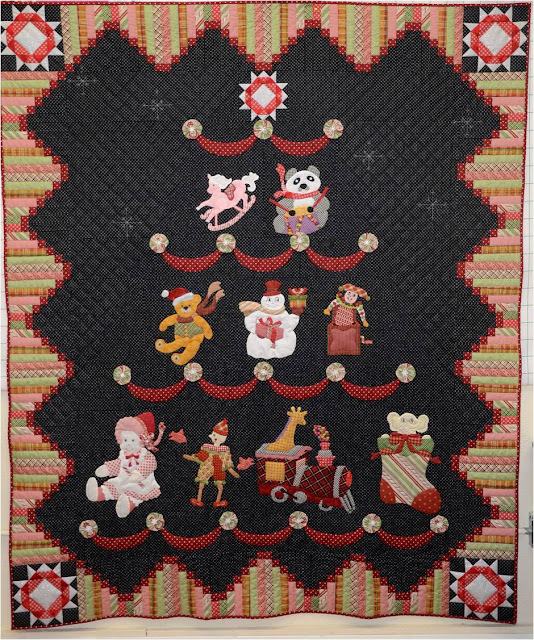 In this quilt, Lynn has arranged the toys in the shape of a tree made with swags, decorated with yo-yo's and topped by a star which is echoed in the four corners of the quilt. 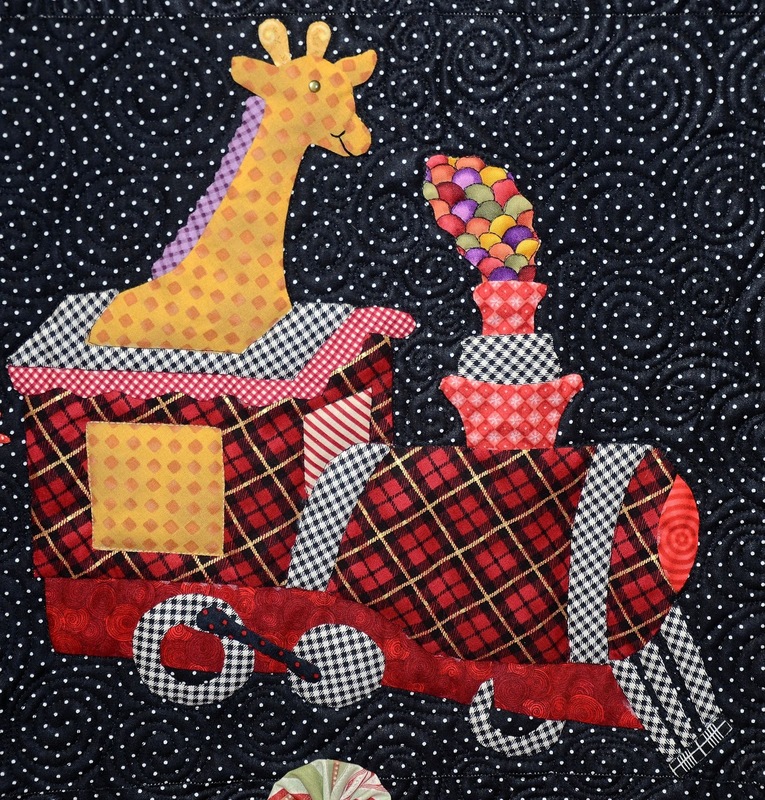 The black polka dot fabric provides a perfect backdrop for the colorful toys. Lynn Wilder says: "I loved to listen to Gene Autry sing 'Frosty the Snowman' on my old 45 rpm record player. I was always sad when Frosty melted. My snowman will never melt away." This looks like a real teddy bear in so many ways. We love the plaid vest and muffler; look at the way the muffler is flying behind the bear, showing the fabric on the back side. Here is a smiling giraffe hitching a ride on a toy train. To add to this playful scene, there are balloons/bubbles coming out of the smokestack! For more photos of Toyland Tree blocks, see the slide show at Sew'n Wild Oaks. The BOM, which will begin January 15, 2013 and run for 12 months, is available at In Between Stitches. We couldn't resist showing one more of Lynn Wilder's designs: The House on Edgewood Lane. The description reads: "Step back to simpler times and make a quilt with fond memories of your first home. 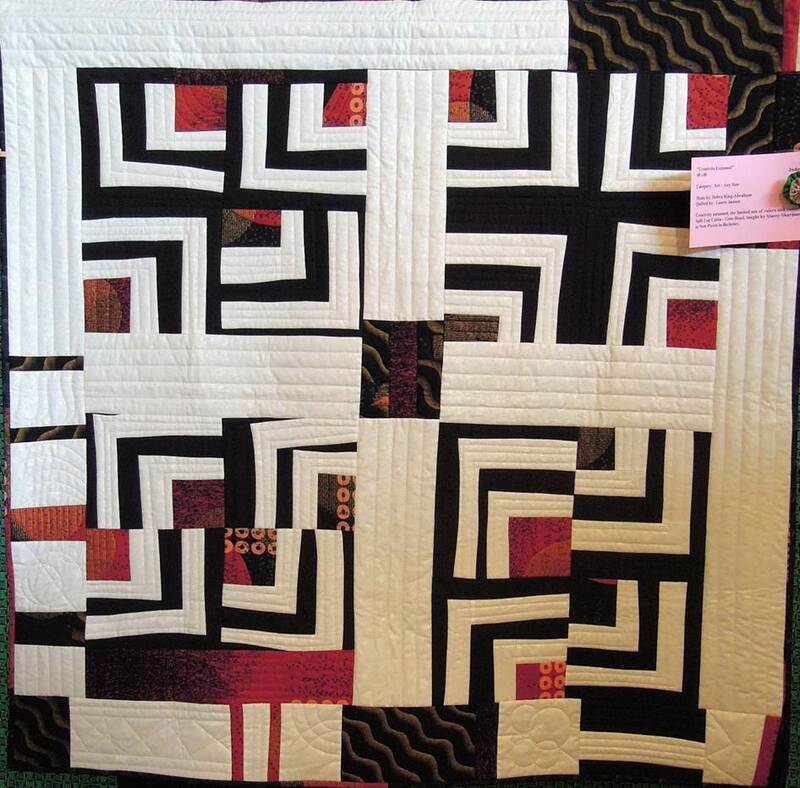 This quilt contains only one block." 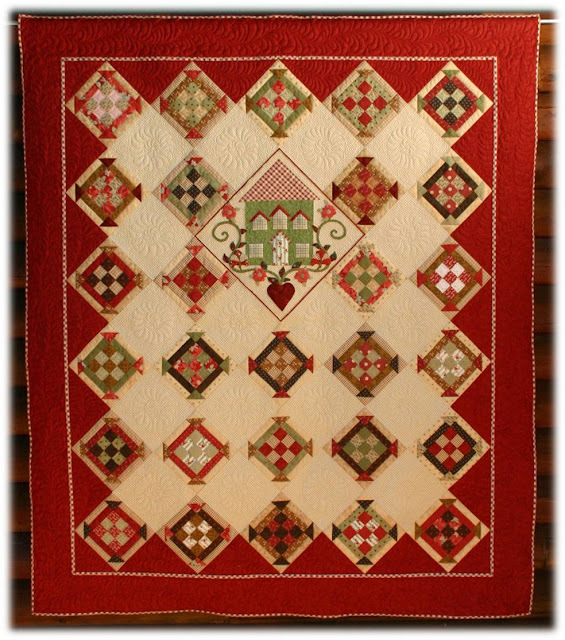 Lynn says: "This is the first quilt I designed and it holds a very special place in my heart." You can read the story and see more photos of this quilt at Sew'n Wild Oaks. 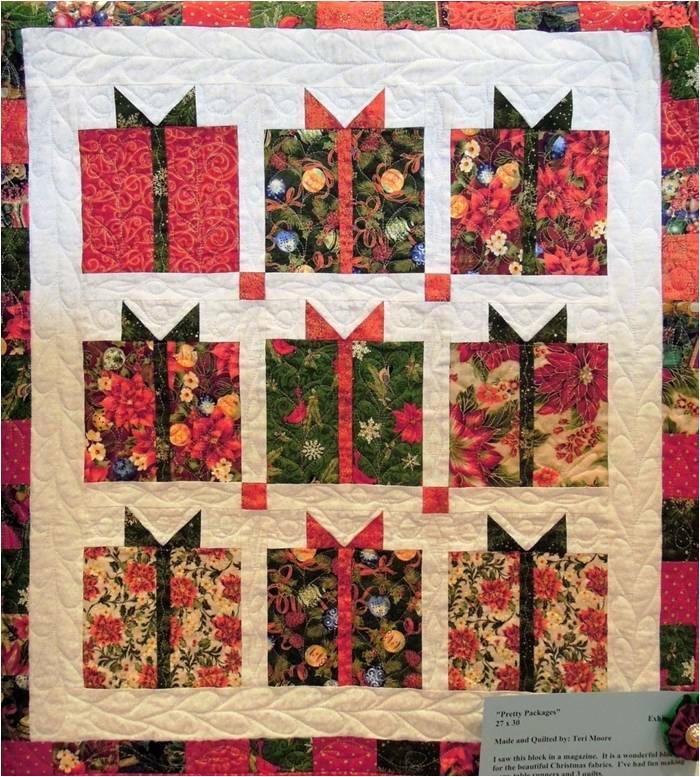 Image credits: Images are shown with the generous permission of Lynn Wilder, who says: "At a very young age, my maternal Grandmother taught me how to make a very simple quilt block on her treadle sewing machine. 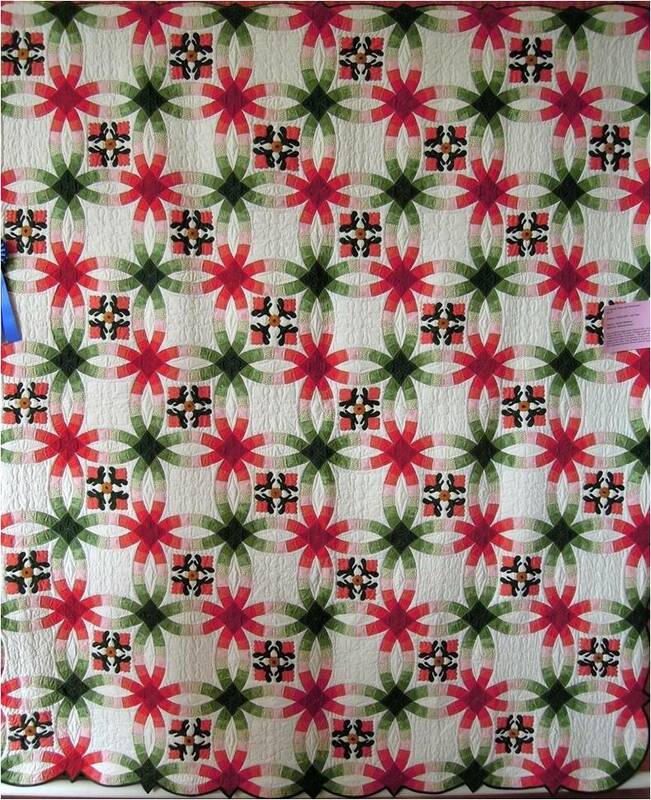 I was instantly smitten with quilting. I now have the machine in my home, and I still have my first quilt blocks! I started to design at the same time that I bought a long-arm quilting machine. I wanted to create my own designs with open areas, and fill them with custom quilting. Four years ago I started my own pattern company called Sew’n Wild Oaks. 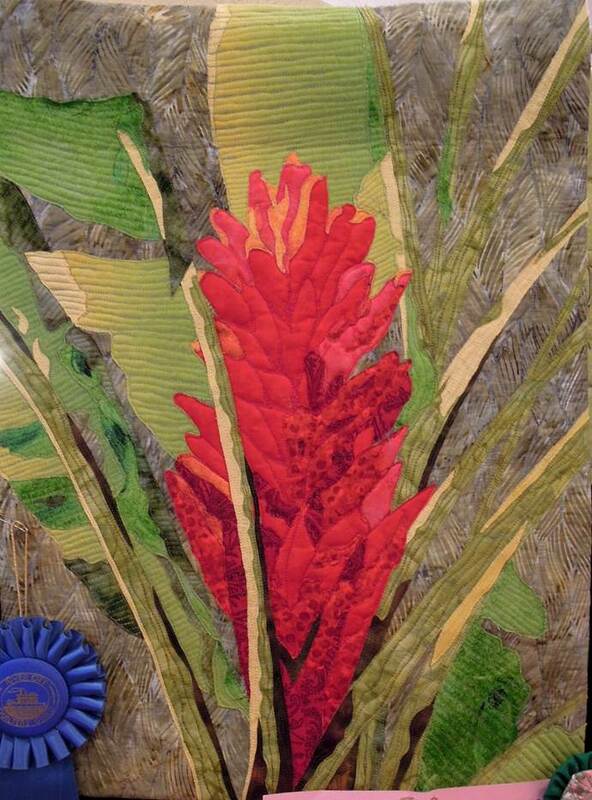 I was the featured artist at the 2012 Georgetown Outdoor Quilt Show. My background is Geography. Prior to my retirement, I was a Geographic Information Systems Analyst at Lawrence Livermore National Laboratory. This is a fancy way to say I was a cartographer with a twist. I mapped, then analyzed data that was collected by scientists around the world. My knowledge and use of color transferred directly to the quilting world....and I've never looked back."